The smell of smoke was thick Sunday night in Edmonton as Environment Canada issued an air quality statement warning people that smoke from B.C. forest fires has moved into west-central Alberta. 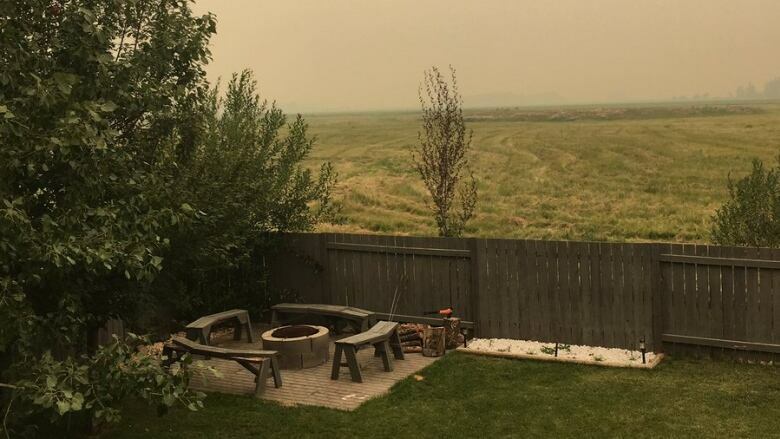 "Poor air quality and reduced visibility will result from the smoke," the statement said. Environment Canada said smoke is expected to clear out later Sunday evening in western areas and overnight in eastern areas. Earlier in the evening, a severe thunderstorm watch turned into a warning for Edmonton, St. Albert, Sherwood Park and Leduc but the warning was lifted by 9:40 p.m.
Areas under a severe thunderstorm watch, as well as an air quality alert, included Drayton Valley, Devon, Rimbey and Pigeon Lake. Camrose, Wetaskiwin and Tofield were under a thunderstorm warning only. Red Deer, Ponoka, Innisfail, Stettler, remained under a thunderstorm watch, while southern parts of the province were taken off the alert list. The thunderstorm is capable of producing strong winds, large hail and heavy rain, and the storm could travel farther north and east throughout the evening, prompting thunderstorm watches for more areas in central Alberta. Heavy smoke from wildfires in B.C. drifted into western areas of Alberta Sunday morning, leading to poor air quality and limited visibility throughout the day. As of 11:30 a.m. Sunday, the Air Quality Health Index was at a level 10 for Beaverlodge, Grande Prairie and Rycroft. A level 10 is the highest on the AQHI scale, a tool which measures health risk in relation to air quality. Smoke exposure can lead to coughing, throat irritation, headaches and shortness of breath. Children, seniors and those with certain health issues are most at risk. Environment Canada suggests limiting time outdoors during periods of heavy smoke. Wearing a mask is not the best means of protection against the smoke, and can even make breathing more difficult, Environment Canada says. Thunderstorms are expected in the Edmonton area beginning early Sunday evening and ending around midnight.